SECTOR: [PASS] KPN is neither a technology nor financial Company, and therefore this methodology is applicable. SALES: [PASS] The investor must select companies of "adequate size". This includes companies with annual sales greater than €260 million. 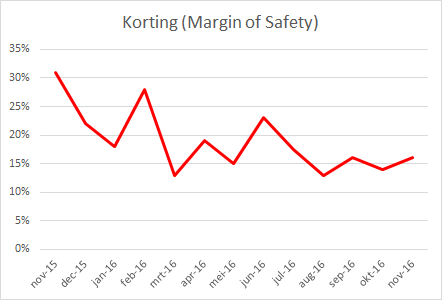 KPN's sales of €7,008 million, based on 2015 sales, passes this test, but sales are decreasing year to year. CURRENT RATIO: [PA SS] Current assets €7 754 divided by short term debt €3 042 = 2.5 which is higher than Graham's limit of 2. LONG-TERM DEBT IN RELATION TO NET CURRENT ASSETS: [FAIL] Long term debt € 9 348 is higher than Net Current Assets €4 712. LONG-TERM EPS GROWTH: [FAIL] Companies must increase their EPS by at least 30% over a ten-year period and EPS must not have been negative for any year within the last 5 years. 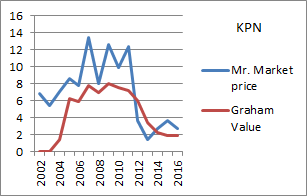 EPS for KPN have decreased since 2003 and therefore the company fails this criterion. It has also lost money during the past 5 years. Earnings Yield: [FAIL] Graham likes to see 7% or higher. 6% fails this test. 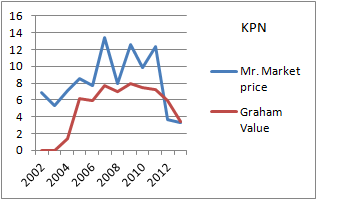 Conclusion: KPN is not a growing, money making machine. The stock price and debt are too high for the Defensive Investor. 2012 numbers: EPS drop from €1,06 to €0,49 , book value/per share and EPS (Earnings per share) will decrease from €2 to €1 and from €0,9 to €0,45 respectively because of a major rights issue which has been announced. De Graham waarde was €1 445 na onze eerste belegging (onder andere in Joy Global Mining die kort daarna veel boekwaarde afschreef). Maandelijks inleg €50 x 12 = €600. Begin waarde €1 445 + €600 = €2 045 eind waarde met 0% groei (zwarte punt in grafiek). 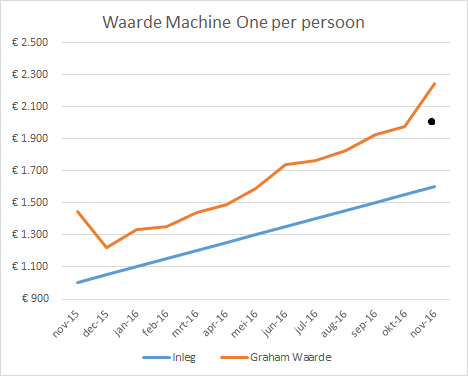 Verschil met de Graham waarde nu ( €2 245 ) is €200. Als percentage van de begin waarde en gemiddeld ingelegd bedrag €1 445 + €600/2 = €200/€1 745 = 11,4% toename. De afgelopen dagen na de verkiezing van Trump als president is de dollar gestegen naar meer dan 92 Eurocent. 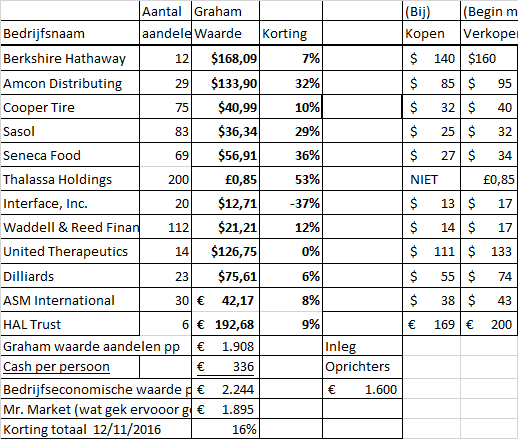 We hebben ook aandelen verkocht boven hun Graham waarde en we hebben 2x Seneca Food aandelen gekocht toen de koers onder $30 daalde. We hebben (te? )veel cash.